Your motorcycle was a huge monetary investment- and if you built it yourself, it was a huge time investment as well. There's probably no other custom choppers in the world resembling the one housed in your garage. Whether you own a custom chopper or a stock motorcycle, your street machine was made for you to enjoy- not someone else. Perhaps that pride is the best reason of all to protect your motorcycle by storing it indoors in a locked garage or shed- or better yet, a protected garage or shed with a security system. But sometimes, the unthinkable happens - even when precautions were taken. How To Get Custom Motorcycle Insurance. Your one of a kind custom chopper gets damaged in an accident- or worst of all, it gets ripped off. Are you prepared for something like this to happen? You should be, whether you like it or not. That's where motorcycle insurance comes in. However, unlike car insurance and even typical motorcycle coverage, there is a lot more involved, and at stake when insuring a custom chopper. This article will tell you what to look for when shopping around. But first- you have to find companies that will insure your piece of work. Not all carriers will insure custom choppers because they are often lacking Blue Book values. This is mainly because these choppers are custom made by an individual, or built from a kit or by an unrecognized custom shop. Because of this, these custom bikes are harder to register, which in turn makes them harder to insure. Many states offering motorcycle insurance will require bikes to be inspected by their Department of Transportation, as well as others requiring owners of the bikes to pass annual or semi-annual safety tests. Also, since some insurance companies will fail to see the uniqueness of each custom chopper, getting the bike appraised for its real value is also a smart idea. To combat this, many times carriers will only issue liability insurance, where damage and injury to other drivers and riders will be covered. Others will however offer the whole kitten caboodle- collision or comprehensive coverage. If you are financing your chopper, you will most always have to have full motorcycle insurance coverage, so finding a motorcycle insurance provider that offers this is important. Perhaps you will want full-coverage anyway, so your entire prized possession in covered- including theft. When shopping for quotes, perhaps looking online is the quickest way to compare rates, without doing a lot of running around or dialing. 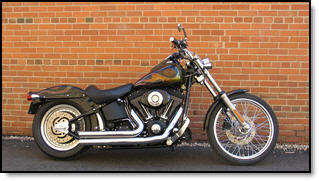 Look for custom motorcycle insurance who understand custom bikes and the needs of their owners.